It’s an age-old tradition, to clear out and clean the house as spring begins. Spring cleaning comes from the days when homes were heated only by fireplaces and doors were kept closed to keep the heat in. It presented the opportunity to air the house out and clean it of soot and grime accumulated over the winter months. Now however, our homes, habits and lifestyles have changed. With central heating and open-plan living we don’t spend winters hibernating the way people used to. 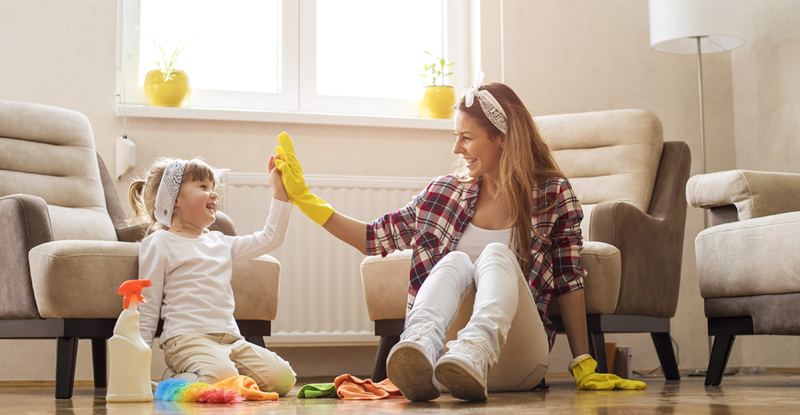 The need to clear the home of soot and grime may not be necessary but taking the opportunity to spring clean your home will give you a refreshed, revitalising kick-start. It’s beneficial in both practical and psychological ways. Don’t know where to start? Here’s a comprehensive list of what to tackle and how. Firstly, declutter every room and throw out or donate items you don’t need. This makes the cleaning process a lot faster. It may take a day or a weekend to complete but it’s so worth the effort. When the cleaning is finished, go ahead and order take out – you’ve earned it! If you’re thinking of selling this spring talk to our team of agents who can recommend things to prepare that will maximise your sale price.